For the Romanian village of Uihei, called Újhely in Hungarian, see Şandra. Sátoraljaújhely (Hungarian: [ˈʃaːtorɒjjɒuːjhɛj]; archaic German: Neustadt am Zeltberg [ˈnɔʏʃtat ʔam ˈtsɛltbɛɐ̯k] ( listen); Slovak: Nové Mesto pod Šiatrom; Yiddish: איהעל‎, translit. 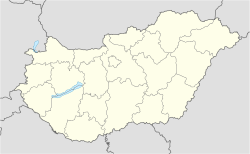 Ihel, or אוהעלי) is a town located in Borsod-Abaúj-Zemplén county in northern Hungary near the Slovak border. It is 82 kilometres (51 miles) east from the county capital Miskolc. Sátor-alja (meaning "under the tent", referring to the tent-shaped hill nearby) was a settlement from the Conquest of Hungary until the Tatars destroyed the town. It was rebuilt in the 13th century, although there was disagreement among the citizens concerning the name: some wanted to keep the original name, and some wanted to rename it új hely ("new place"). Sátoraljaújhely was granted town status in 1261 by King Stephen V, and a castle was also built around that time. Sátoraljaújhely has often played an important role in the region's history: revolts against Habsburg rule began there in the 17th and 18th centuries. After the Revolution of 1848, Sátoraljaújhely developed rapidly owing to its location close to important trade routes leading to Poland, Russia, and Transylvania. The town's light industry led to it becoming the capital of the comitatus (county) of Zemplén in the 17th century. Sátoraljaújhely has always been an important town in culture. Ferenc Kazinczy, one of the reformers of the Hungarian language, lived here in the 18th century. At the turn of the 20th century the town was home to a small but important Jewish community: some 4,500 of the town's 13,000 residents were Jewish. The community counted among its members Moses Teitelbaum and Michael Heilprin. Under the Treaty of Trianon, Hungary lost its northern territories. The border was set at the Ronyva stream, splitting the city into two parts. One-fifth of the population and one-fourth of the territory of the town became part of Czechoslovakia. The newly created village got the name of Slovenské Nové Mesto ("Slovak new town") in Slovak; Szlovákújhely ("Slovak new town") or Kisújhely ("Little new town") in Hungarian. Two railway lines and the industrial zone were lost to Hungary. The town's industry was being rebuilt during the interwar period, but the outbreak of World War II disrupted this development. Nazi repression, continuous bombing after 1943, the killing of most of its Jewish population (most were forcibly sent to Auschwitz) and finally the Soviet occupation left the town in a very poor condition. During the reorganisation of administration in 1950, the former comitatus of Zemplén became part of the united Borsod-Abaúj-Zemplén county, and Sátoraljaújhely lost its county capital status. Sátoraljaújhely was rebuilt again and is today a national ski centre and tourism destination. Historically, Ujhely (Sátoraljaújhely) belonged to the county of Zemplin. Documents show that in 1734 Jews were living at Sátoraljaújhely and that they were allowed to acquire real estate. It is evident that the community was then increasing; for 10 years later the Jews possessed a school which in 1829 received a bequest of 260,000 gulden from Martin Raphael Kästenbaum, and which was thenceforth known by his name. The oldest tombstone bears date of 1760, although the ḥebra ḳaddisha, with which was connected to a hospital, was not established until 1772, its founder being an itinerant rabbi named Naphtali Hirsch. The first ḥebrabook has a drawing on its title-page representing the last rites. A synagogue was built at Sátoraljaújhely in 1790; and when it was demolished in 1887, to be replaced by a new house of worship, it was found to have 8 subterranean chambers, which probably served as dungeons. The oldest document of the community is dated 1831, during the rabbinate of Moses Teitelbaum, of whom the story is told that Lajos Kossuth, afterward leader of the Hungarian Revolution of 1848, when suffering from an infantile sickness, was brought to him, and that the rabbi blessed the child and, referring to the word "ḳosheṭ" in Psalm lx. 6 (A. V. 4), prophesied his future greatness. Teitelbaum died in 1841, and was succeeded by his son Leopold Teitelbaum, who, however, soon went to Marmaros-Sziget. Jeremiah Löw was then appointed rabbi of Ujhely. Löw, who was one of the leaders of the Orthodox party, was succeeded by the chief rabbi, Koloman Weisz, and the preacher Isidor Goldberger. Michael Heilprin, who acted as secretary to Minister Bertalan Szemere in 1848, was, prior to the Revolution, a teacher in the Jewish school of Ujhely. Wine Church, the only known church in Hungary not owned by any denomination, as it was used to store wine in past centuries. Baroque town hall, a Renaissance building of the former Zemplén comitatus where Ferenc Kazinczy worked. Former Financial Palace, a mark of the town's great economic importance in the 19th and the early 20th century. Abandoned synagogue cemetery - Sátoraljaújhely was once home to Hungary's second-largest Jewish community. See also: Category:People from Sátoraljaújhely. ^ "Krosno Official Website - Partner Cities". (in Polish) © 1998 - 2001 Urząd Miasta Krosna. Retrieved 2008-10-23. Wikimedia Commons has media related to Sátoraljaújhely.